“What happens if you live in Kansas and you want sustainable seafood?” I get this question occasionally. Interestingly, Kansas seems to be the state most often cited. Perhaps it’s because it’s flat as a pancake and just about as far away from any coastline as any state in the union. But, it’s a valid question, and one that came up Wednesday night at the latest KNOW FISH Dinner® at Enoteca Athena in Brunswick, Maine. This was the 10th in the series of events aimed at bringing communities together to meet the harvester who caught or grew the seafood they’re eating and learn more about why their choices matter. The question of knowing the story of your seafood permeated the discussion throughout the evening. We’ll return to that question in a bit. 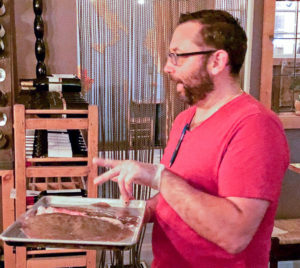 Chef Tim O’Brien went above and beyond the call of duty by staying up until 2 a.m. that day figuring out the most efficient way to skin a couple dozen skate wings (think gloves, towels, a sharp knife and some strong language). This was part of the prep for a fabulous meal also featuring yellowtail flounder, haddock, European green crabs and oysters from Mook Sea Farm. 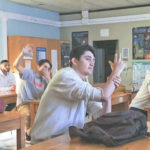 Jeff Auger of Mook Sea Farm talked about the long time between receiving spat (or seed) and growing oysters to market weight and the many variables, such as climate, that can affect the success of the process. As he spoke, we feasted on his Mookie Blues oysters from Damariscotta that Tim had fried perfectly and served with a spicy lemon aioli. Tim emphasized the importance of local sourcing, or at least, knowing the source of the food he serves. He mentioned connections with different fish and shellfish providers and local distributors as we enjoyed delicately balanced yellowtail flounder ceviche (“cooked” in blood organge and balsamic vinegar) caught the day before by Capt. Tim Rider of New England Fishmongers. 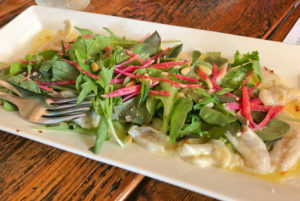 The flounder was served amid a crisp spring, palate-awakening salad of greens, chives watermelon radish and pine nuts. 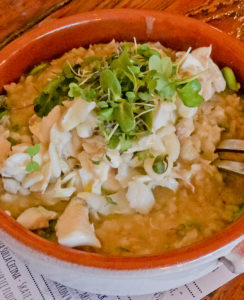 As we discussed getting seafood smart about underutilized species, we devoured a risotto made with green crab stock, green crab roe and haddock. European green crabs have been around the U.S. coast for almost 200 years, can eat up to 40 mussels a day and can produce up to 160,000 eggs a year. They destroy eelgrass beds while devouring larval mussels, clams and oysters. So it was good to hear from Marissa McMahan of Manomet that a collaboration of researchers and fishermen are sorting out the soft shell timing of green crabs in hopes of creating a consumer market to eat the invasive species. An established market already exists in Italy. The stock and roe added a fabulous flavor to the risotto, which also featured roasted haddock and daikon radish. Excellent balance. Risky move showing the before side of the skate story? Nah, it’s all part of getting to know your seafood. Chef Tim O’Brien describing the process and the benefits of this under-loved species. 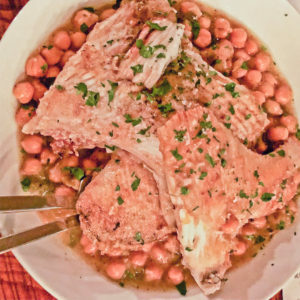 The last course was “Razza Sull Cecina”, the heretofore mentioned skate wing pan-seared with rice flour and finished atop cecina, which is an outstanding preparation of wine and butter braised chickpeas, leeks, garlic and black pepper. The skate was tender but flavorful with the cecina backdrop. As we discussed the importance of knowing the story behind the seafood, I talked about Capt Tim Rider, who also provided the haddock and the skate for the dinner. He planned to attend the dinner and tell his story so people would have context behind the fish they were eating. Sadly, he was unable to make it because he had to tow in a fellow rod-and-reel fisherman whose boat broke down offshore. 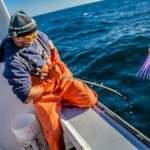 New England Fishmongers forges close relationships with chefs to bring in fresh, properly handled seafood harvested in the Gulf of Maine. Capt. Tim and his crew often leave the dock at 1 a.m. and return late in the afternoon or in the evening, only to turn around and do it again. If someone is broken down out on the ocean, they help them out. That is his story, and it’s the story of many fish harvesters. Knowing who caught your fish, when, where and how they caught it is great if you can discover that. Those of us fortunate enough to live around the Gulf of Maine live in the cradle of one of the seafood capitals of the world. We don’t have to work too hard to find fresh, locally harvested fish and shellfish, and the story behind it. Fresh off the boats. The haddock came from Capt. Tim’s Finlander I in Porstmouth, NH, and the flounder and skate came from his Finlander II in Gloucester, Mass. All delivered to Chef Tim in Brunswick the night before. Folks in Kansas? Not so much. So my answer to the question about what they can do stems from the premise behind One Fish Foundation: Know your seafood. I believe habit, driven by price is one of the main catalysts behind the astronomically high rate (90%!) of imported seafood in the US. 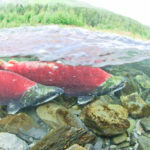 You want salmon for dinner in the Heartland? You go to your local Walmart or other chain, grab the salmon in the case and head for the checkout. You may even read the label and see that it was “all natural” and farm-raised “fresh” in Chile. And that may be all the information you need to make your decision to buy. But it’s also all the information you need to give you pause. Suppose you knew that Chile salmon farming operations have the highest rate of antibiotics use, by far, of any country in the world. Even with all of that antibiotic use, Chile suffered a massive algal bloom in 2016 due to a confluence of environmental and management issues such as improper net pen siting and overcrowding. Twenty-four million fish died at a roughly $1 billion cost to the industry. To get around the BIG hurdle of habit, we need to be having more of these conversations about why our choices matter. So yes, knowledge is power. 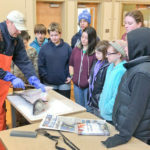 For folks in Kansas, some knowledge could help them realize that even though they can’t get pollock right off the boat, they may be able to get some that has been caught domestically. The technology for frozen-at-sea products is such that the freshness of the fish or shellfish is preserved as if it had just come out of the water, if done properly. This was an enlightening discussion at Slow Fish 2018. The US has some of the highest standards for food safety and fisheries management in the world. And if your local store doesn’t have anything that fits the bill, apply some pressure. It may take some time, but consistent pressure can change their buying policies. Also see if there is some sort of community-supported fishery that may provide good, responsibly harvested domestic seafood. 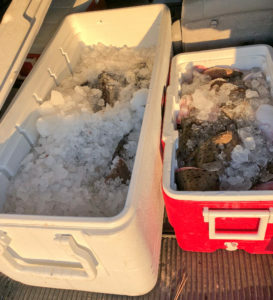 Like a CSA for farm produce, a CSF offers nearly direct from the boat fish delivered weekly (or whatever timeframe) for buying a share up front. Some operations provide this service in the heartland. If price is a factor, look for a species that is abundant, and not salmon, tuna, cod, etc. Try cusk, for example. Also, some seafood counters offer the small pieces that can’t be sold alone at affordable prices. Cost can be the elephant in the room, particularly for those who may not be able to afford “sustainable seafood,” and it will be a topic for a future blog. 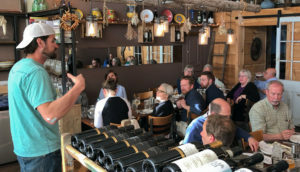 So the KNOW FISH Dinner at Enoteca was again a great discussion set to the backdrop of an outstanding meal prepared with locally harvested seafood with a compelling story behind it. We’ll keep trying to change the import dynamic, one conversation at a time.